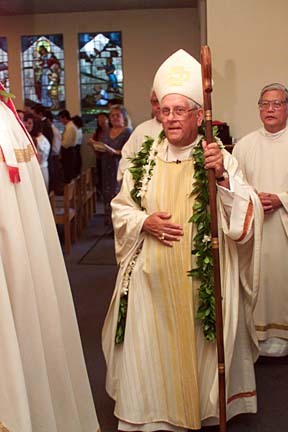 Bishop Joseph Ferrario walks in the procession at the beginning of the 2001 Jubilee Mass honoring him at St. Theresa Co-Cathedral in Liliha. Retired Bishop Joseph A. Ferrario, who led the Catholic diocese of Honolulu for 11 years, preaching tolerance and community outreach, died Friday night at St. Francis Medical Center in Liliha. Ferrario, originally of Scranton, Pa., was 77. Ferrario was initially taken by a friend to Castle Medical Center, where his successor, Bishop Francis X. DiLorenzo, administered the sacrament of the sick, formerly known as the last rites, diocesan spokesman Patrick Downes said. After his condition worsened, Ferrario was transferred to St. Francis Medical Center. "I have lost a very dear friend," DiLorenzo said. "He was a man of the people, always reminding us all that you just have to be good," said Shauneen Tejeda, a 40-year member of St. Anthony Church in Kailua, where Ferrario was a pastor for two years. "He was always a priest ... always doing priestly work. He told us, 'If you haven't got the treasure, give your time,'" she said. Tejeda and others gathered outside St. Anthony yesterday before the evening Mass to remember their former pastor and bishop. He was at the church just Wednesday leading a penance reconciliation group, said one. He loved golf, said another, and Italian food. And cards, another blurted out, and they all laughed. "I loved him very much," said Margaret Peters, a member of St. Anthony's for more than three decades. "He opened my heart to the Holy Spirit," she added, holding back tears. Ferrario came to the islands in 1957 to teach at St. Stephen Seminary, now St. Stephen Diocesan Center, in Kaneohe. In 1973, Ferrario was appointed as pastor of Holy Trinity Church in Kuliouou and two years later filled the pastorship at St. Anthony's. In 1982, Ferrario was appointed as the third bishop of Honolulu's Catholic diocese. As bishop, he distilled his goals into three key words --- "outreach," "unity" and "renewal" -- "OUR church." During his 11 years in Hawaii's highest Catholic post, Ferrario pushed for programs to help the poor, openly welcomed gays into the church and was named to a gubernatorial committee aimed at fighting AIDS. He also ordained 19 priests and established St. Jude Parish in Makakilo and the Resurrection of the Lord Parish in Waipio-Gentry. The Rev. Dennis Koshko of St. Anthony's, who worked under Ferrario for 10 years, remembers the former bishop as a leader who always had a "very set plan" and a strong opinion. "He was very clear about his vision," he said. But Ferrario wasn't admired by everyone. He angered some Catholics when he backed a bill prohibiting workplace discrimination on the basis of sexual orientation. In 1989, Ferrario became the first U.S. bishop publicly accused of molesting a young boy. Ferrario's male accuser maintained anonymity at a 1989 press conference, then went public and filed a 1991 lawsuit that was dismissed as too late. The bishop continually denied the charge. Ferrario excommunicated six of his critics from the church in 1991, but the Vatican overruled him. Ferrario retired because of poor health in 1993, a year after having quintuple bypass surgery. He was admitted to Castle Medical Center on Friday night with chest pains and later taken to St. Francis Medical Center, where he died at 10:25 p.m.
During Mass at St. Anthony's yesterday, Koshko told the church's members of Ferrario's death and led the group in prayer for the former bishop. A photo of a smiling, vibrant Ferrario stood on a small table at the head of St. Anthony church yesterday with a lei around its frame. "He was a very humble kind of person," said lifetime church member Marie Gomes, who stood before yesterday's Mass looking at her former pastor's picture. "I enjoyed him very much." Following his retirement, Ferrario helped raise scholarship funds for Catholic school children as vice president and CEO of the Augustine Educational Foundation, which he had established. Ferrario is survived by sister-in-law Marianne Ferrario, two nephews and two nieces. Funeral arrangements are pending.